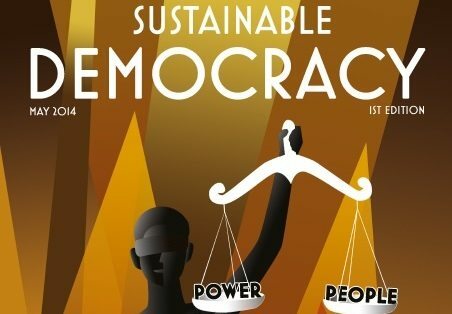 How do we make democracy sustainable? That’s a question we set out to answer in The Guide to Sustainable Democracy 2014, which is published exactly a year to the day until the 2015 general election takes place. Providing answers are politicians from the major parties, as well as leading reform organisations, thinktanks and campaign groups. The result is a guide that we hope serves as a starting point on how to combat key issues like voter apathy and falling turnouts at elections. Also included are the results of a survey that we conducted with Vote for Policies, the online blind taste test that encourages people to vote for the parties whose policies they most agree with, and not the one with the most charismatic leader, for example. We asked nearly 7,000 people what measures they thought would help best reform the political system and the results are fascinating. We look at the timely issue of Scottish independence and analyse whether Russell Brand is right in telling people not to vote. Meanwhile, crucial context is provided in the form of a feature on the Magna Carta – which turns 800 years old in 2015 – and a review of a recent Intelligence Squared event on the effectiveness of democracy.